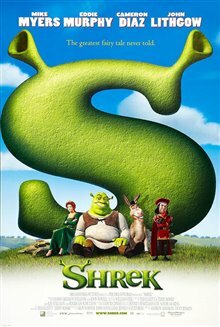 In this computer-animated tale, Shrek (Mike Myers) is a big green ogre whose swamp has been invaded by numerous, annoying fairy tale characters. To get rid of them, he makes a deal with the tyrannical Lord Farquaad (Lithgow), the ruler of Duloc, who had banished the creatures from his wannabe kingdom. Shrek agrees to rescue Princess Fiona (Cameron Diaz), Farquaad's intended bride, from a fire-breathing dragon and take her to Farquaad. 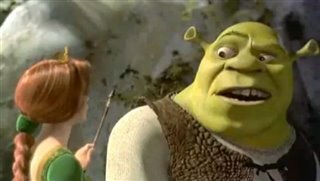 Before his travels begin, Shrek unwittingly rescues a over-talkative Donkey (Eddie Murphy) who decides to join him on his quest. Based on the picture book by William Steig. "Clever and funny fairytale which puts many typical fairytale cliches upside down." "I LOVED SHREK... DONKEY WAS A HOOT !!" "stimmt leider.. ich find's shdcae, wie heutzutage mit ein wenig halbherzigem 3d hier und da fcber eine gute storyline oder eine liebevoll erstellte bildkomposition hinwegzute4uschen versucht wird.. shrek letztens gesehen und kann deine meinung nur teilen..aber: spitzen blog, das hier, nur weiter so, bitte!"